On May 1, International Workers Day, I had the privilege to accompany Madame Christiana Ohene Agyare, President of Kuapa Kokoo Farmers Union, and Mr. Kwasi Aduse-Poku, Managing Director of Kuapa Kokoo Ltd., to attend church with, and later meet, former US President Jimmy Carter at his church, the Maranatha Baptist Church in Plains, Georgia. They were in the US for a Board Meeting of Divine Chocolate Inc, to be held in Washington, DC, and traveled nearly 32 hours total to get to Plains. 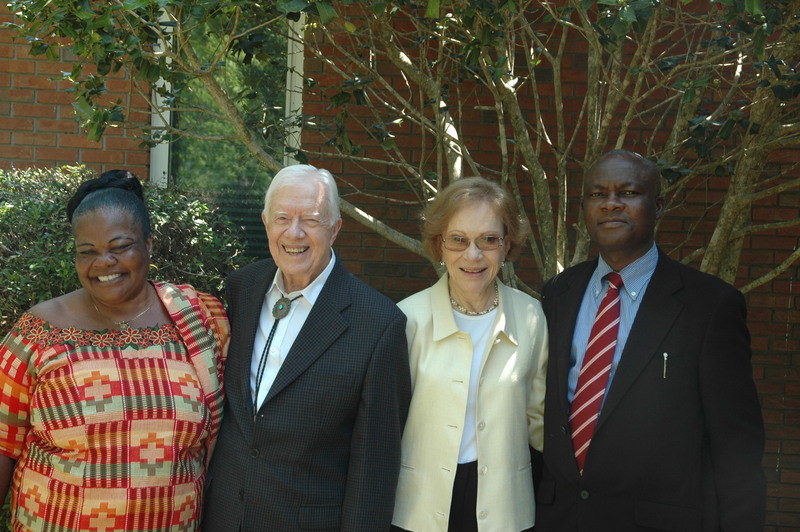 For most of the time since President Carter left office, he has held almost weekly Sunday School sessions at his church, part of his commitment to service of others, and also to make himself available to people. When we arrived at the church, we waited in line for our turn for the security dog to sniff our car. Once clear of that, we parked where we were directed by a Secret Service agent, and walked to the next queue, this one to check bags, purses, and individuals with security wands. We then proceeded into the sanctuary, and had the honor of sitting in the front row. What followed was a briefing on dos and don’ts once Sunday School started, and the woman instructing us, Miss Jan, was very thorough, and very informative. Among other things we learned that Rosalynn Carter’s first name is Eleanor, and that President Carter was the first American president to be born in a hospital (his mother was a nurse), and to live in public housing (after he left the Navy). The ground rules are necessary to make the process manageable for the church, which is quite small, and for President Carter, who is now 86 years young, as there can be several hundred visitors on a given Sunday. Apparently at the peak years back as many as 600 people would show up. This Sunday there were closer to 150, including 50 Canadians on a tour bus. President Carter came out about 10 am and spoke to the crowd, finding out where people were from, and then told us what he had been up to the past week – meeting with Kim Jong Il in North Korea. When he heard our guests say they were from Ghana, he gave them a special welcome and commented on the work the Carter Foundation has done and is doing in Ghana, both monitoring elections for fairness and also working to eradicate the guinea worm from water supplies. He then proceeded to teach the Sunday School lesson. Madame Christiana was appreciative of his comments about the scriptural foundation of gender equality, a basic tenet of Kuapa Kokoo, and Mr. Aduse-Poku took many notes. The regular service commenced next, and when Jimmy and Rosalynn Carter entered the church for the main service, they came over again and welcomed our Ghanaian visitors. After the service was over, we went outside and met briefly with the Carters, and took a few pictures, and of course, gave them a sample of Divine Chocolate. We had been told they always give away anything they are given, but Mrs Carter seemed very interested in this particular thank you! We also spoke briefly to them about Divine’s farmer-owned business model, and thanked President Carter for his comments about gender equality. We went after church to Mom’s Kitchen for fried chicken, collard greens, and other southern specialties, as did most of the local people we met at church, and we had another round of conversations with folks who wondered who the Ghanaians were, and why the Carters had spent time with them. They were thrilled to learn it was all about chocolate! In Oxford today – this morning as guests of Mid-Counties Co-op at their Fairtrade Fair in the gloriously ornate Oxford Town Hall. 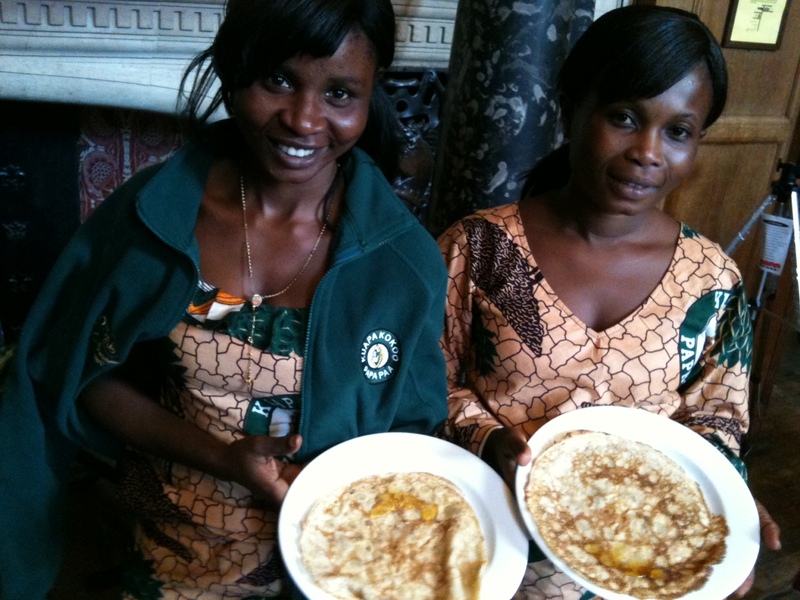 After a Fairtrade fashion parade featuring models from 6 months to 60, and their first taste of pancakes, Kuapa farmers Harriet and Fatima presented their experience of farming and Fairtrade. There were lots of questions, photos, and then African drummers from Guinea (via Stourport). In the afternoon we jumped into a cab up to Oxfam GB (divine’s long time supporter and customer) to join their celebration of International Women’s Day. 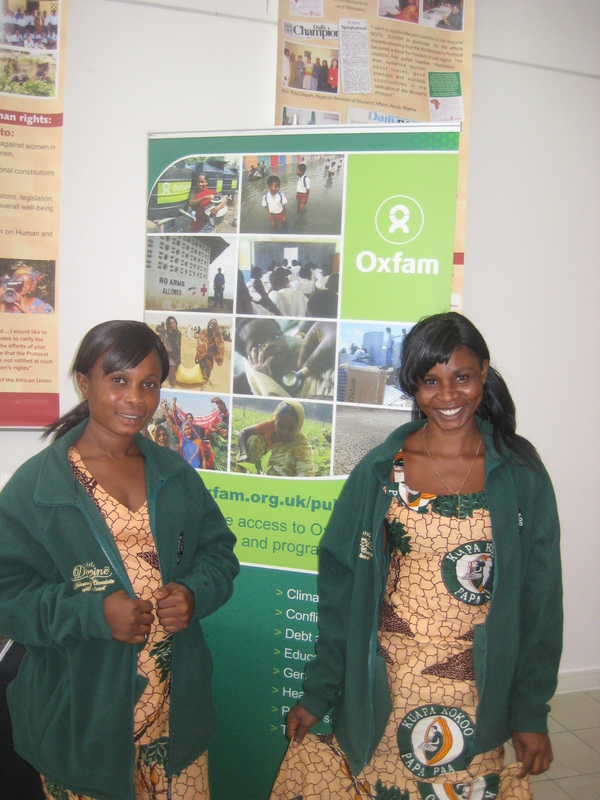 They were involving the staff in a day of talks and displays about gender issues worldwide (Oxfam is one of the NGOs contributing to the EQUALs compaign). Harriet and Fatima drew a big crowd, standing room only. This time they both gave much more personal stories about how membership of their co-operative had empowered them. They have achieved such great things and are inspiring role models for other young women in their communities. They were asked if there was any male backlash (sometimes men are jealous they say), about the size of their farms and cocoa prices. Later they were off to dinner with the buyers for all the Oxfam shops. 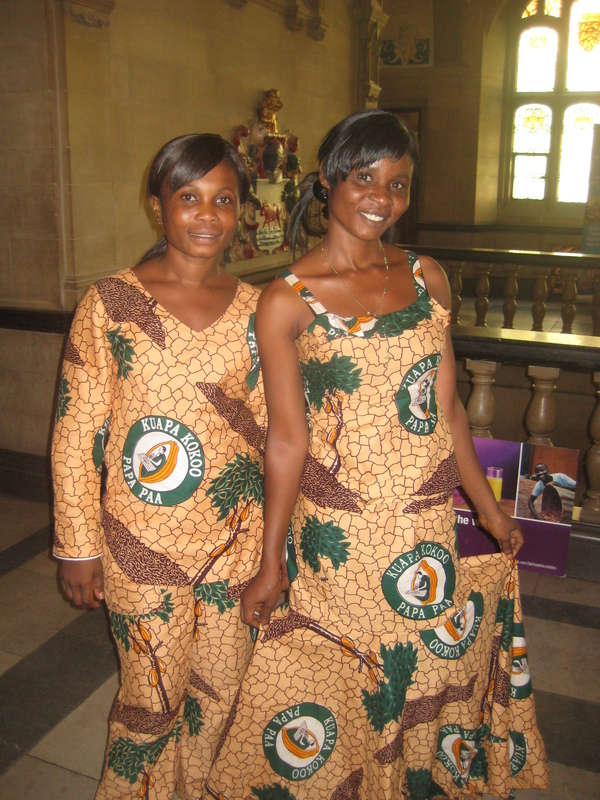 Harriet & Fatima, fresh from the rainforest in the Western Region of Ghana, braved the freezing British winter to launch of Fairtrade Fortnight 2011 in Greenwich. Greenwich became a Fairtrade Town in 2006. (And by the way Ghana is also on the zero meridian and Greenwich is Twinned with Tema in Ghana.) Cllr John Fahy and Cllr Jim Gillman the Deputy Mayor of Greenwich welcomed everyone to the newly refurbished Eltham Centre and congratulated everyone for the success of Fairtrade, the market is now worth more £1.17 billion in the UK and is benefiting millions of poor farmers around the world. Chris from Cards for Africa spoke and showed a little film showing how buying a beautiful greetings card can support dignified jobs for young people in Rwanda who have been orphaned by the war. 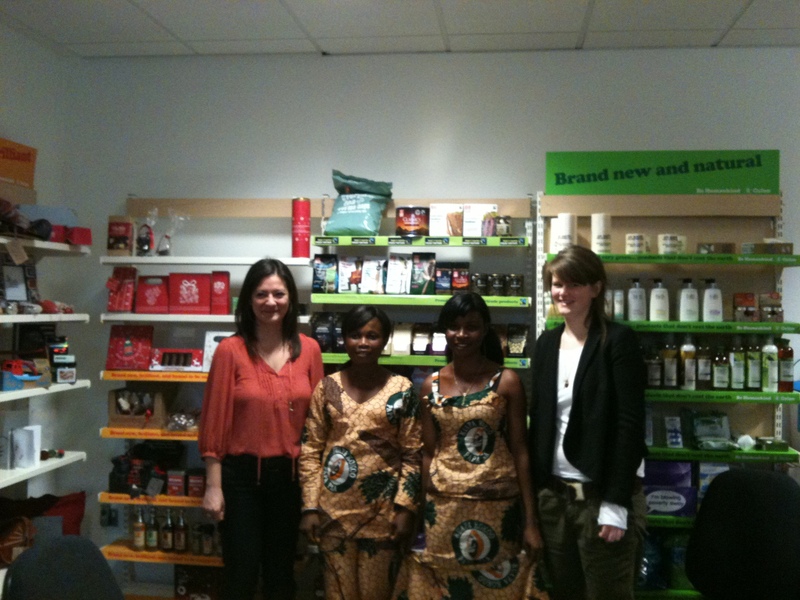 I introduced Harriet and Fatima and congratulated Greenwich on being a Fairtrade Town. I’m really proud London has achieved Fairtrade Status and is the largest Fairtrade City in the world. 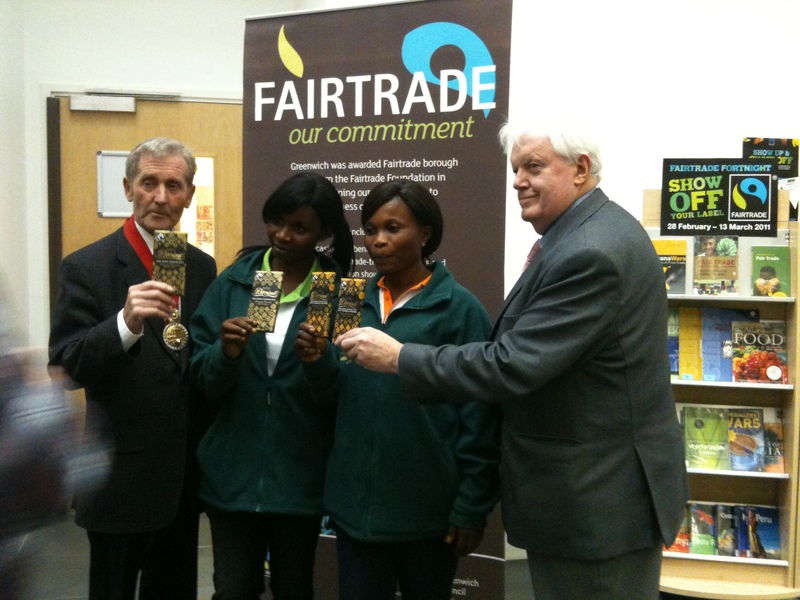 I hope Greenwich will help us achieve our ambition of delivering the First Fairtrade Olympics. 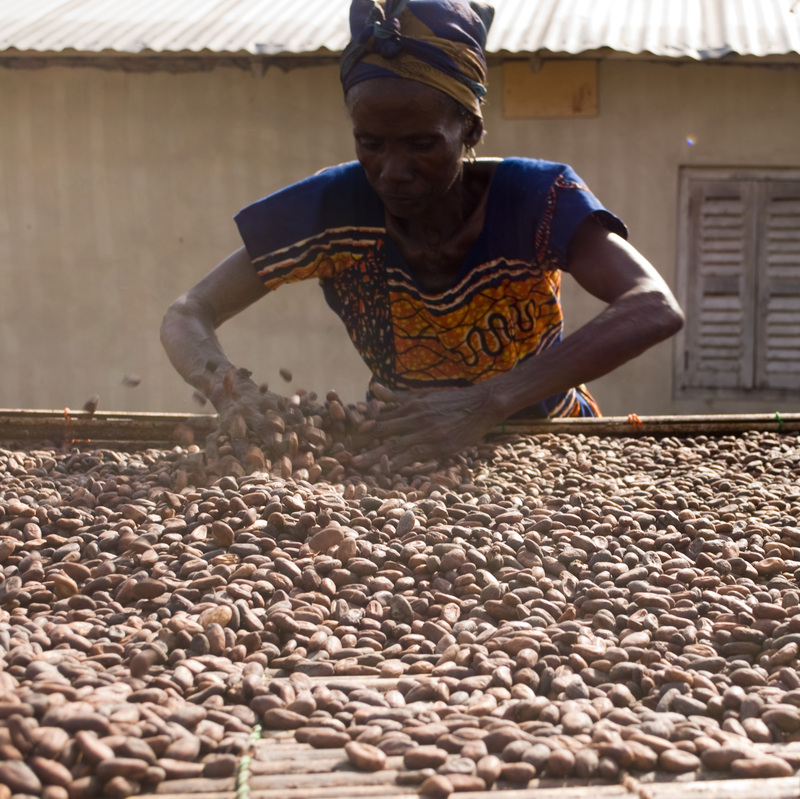 Harriet and Fatima described their experience as farmers – how they cultivate, harvest, ferment and dry the cocoa beans that go into Divine and how they have benefited from the additional premiums they earn from Fairtrade sales. They showed bonny pictures of children in schools they have built and people enjoying clean water from wells that have been sunk. Kuapa’s commitment to gender empowerment has been made real by the presence of these two confident young women. They never could have imagined that they would be representing their co-operative , a successful business trading 30,000 tonnes of cocoa with a turnover more then $50 million last year. 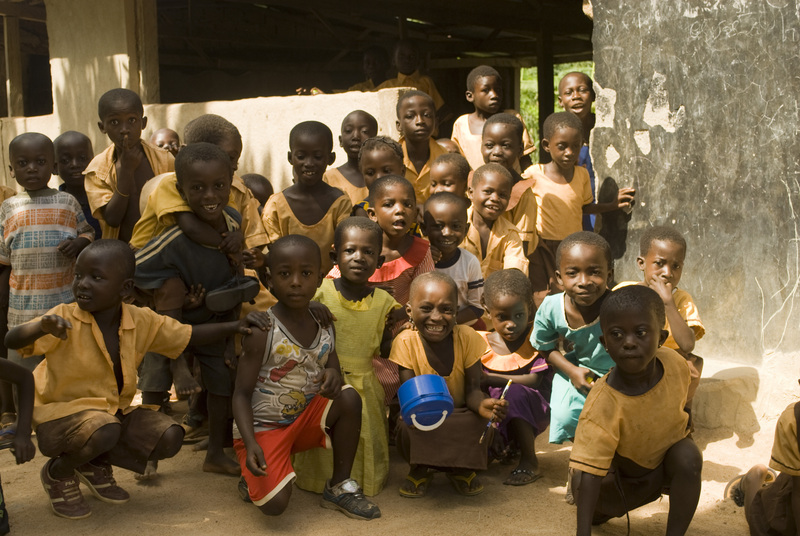 John Dornu is the Recorder in Akonfudi – the person elected to be in charge of collecting the cocoa from the Kuapa farmers. He’s been a member of Kuapa Kokoo since 2008. He is thirty-three years old and lives with his wife Doris and their stepdaughter. 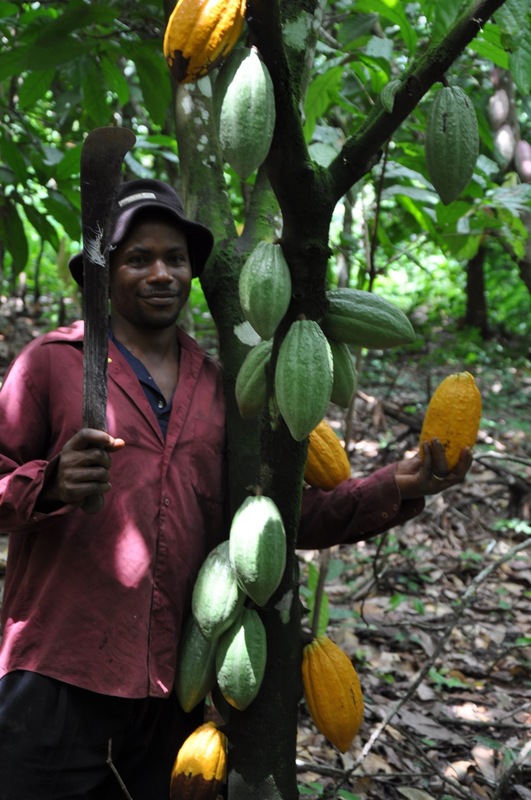 John has a big farm of thirty-six acres, which his father bought already in 1964, and in 1969 he planted cocoa on it. Last week I was able to join him to see the first step of harvesting his cocoa. We started off in the village and walked for almost an hour before we reached the farm. 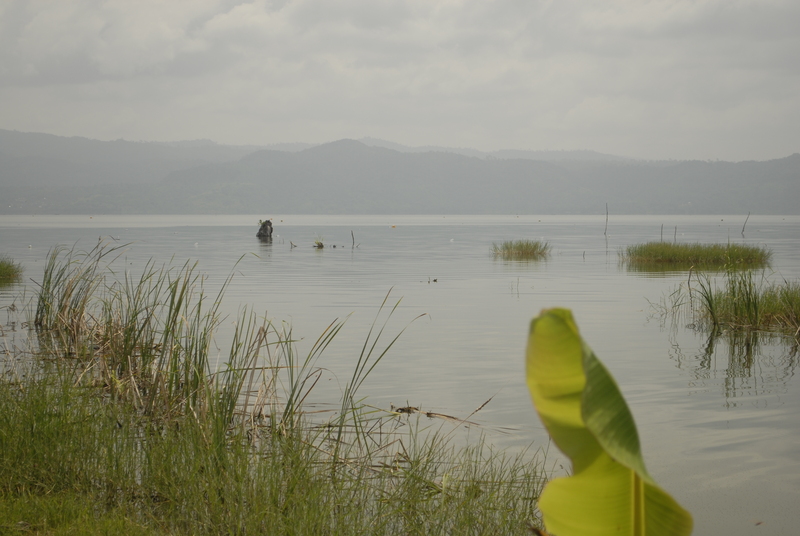 The landscape was green and we walked along paths between other farms, where orange, lemon, cassava, cocoa, oil palm, corn and garden vegetables where grown. When we got there, I was exhausted because of the long walk in the sun – this is a walk John does several times a week. John usually goes to the farm at 7:30 am and comes back around 3:30 pm. 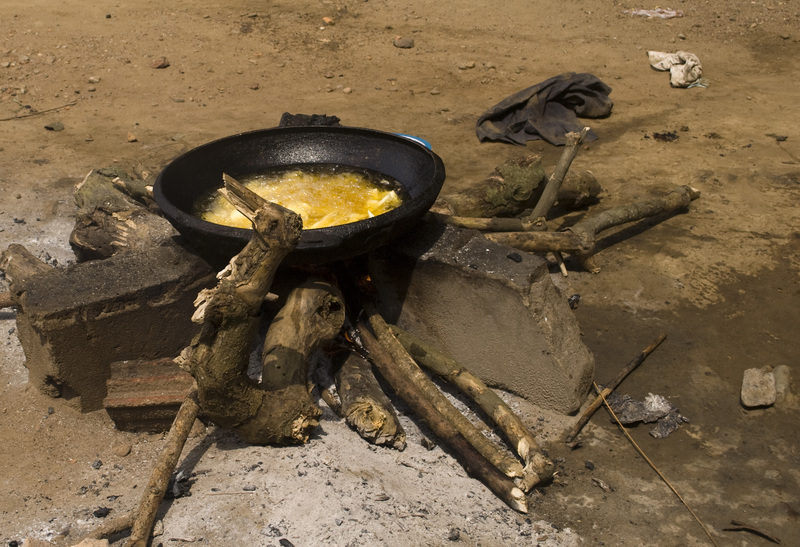 When the working days are long, he has to cook his meals on the farm. The first and last thing he does is to say a short prayer, thanking God for allowing him to reach the farm safely and to help him to do a good job. John works at his farm at least three times a week, but never on Fridays, which traditional are a ‘taboo day’ to work on the farm. John explains that on his farm he has four varieties of cocoa. They all look different and the colour and size varies from long purple, to round and yellow to oval and orange. It is really a wonderful sight to see the cocoa growing from the trees. The four varieties are Tetteh Quarshie (the name of the man who first brought cocoa to Ghana) and the newer sorts that are called Hybrid, Amizona and Asotem. 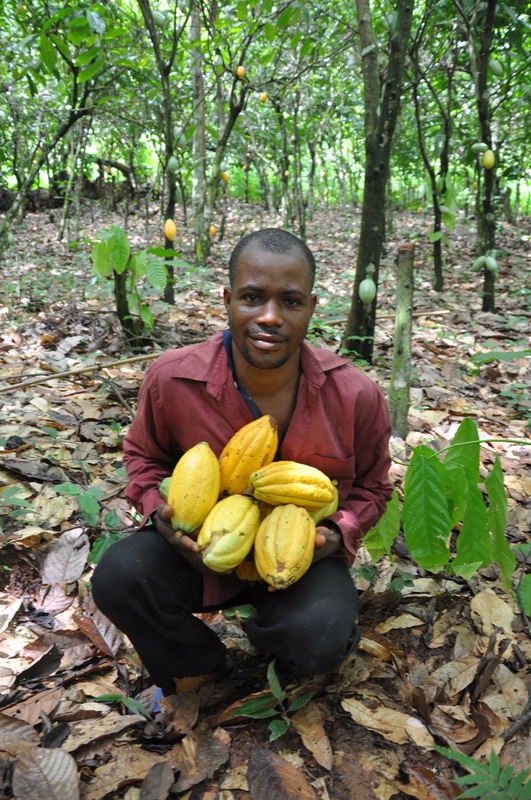 John says that the flavour does not vary between the four varieties, but that Hybrid, for example, grows faster and gives fruit already after two years, compared to the Tetteh Quarshie cocoa that needs almost ten years before you can harvest the cocoa. When we reach the cocoa farm, John starts using the machete (a long metal knife) and a long stick with a hook in the end to cut down the cocoa pod from the trees. The cocoa pods grow directly from the stem of the tree or hangs from the branches. Next John opens the cocoa pods, takes out the cocoa beans and ferments the cocoa for at least five days, before it can be dried in the sun. When we walk back to Akonfudi, we take a shortcut, but because it has been raining last night the road is flooded and we need to walk through knee-deep water for some hundreds of metres. Children going to school, farmers attending to their farms and everybody else living just outside the village use the road. 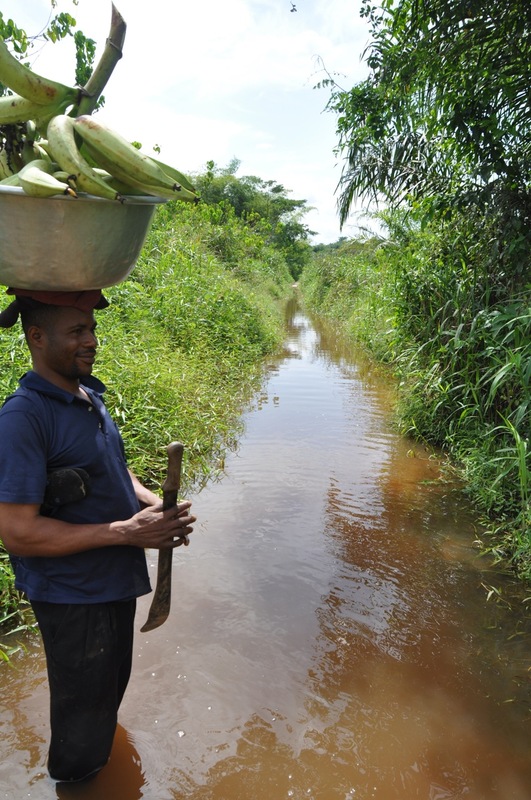 Not only do the cocoa farmers have to walk far distances to reach their farms, but they also have to carry heavy loads on their head when bringing the fermented cocoa back to their house to dry it, and also have to walk in water or along poor roads. 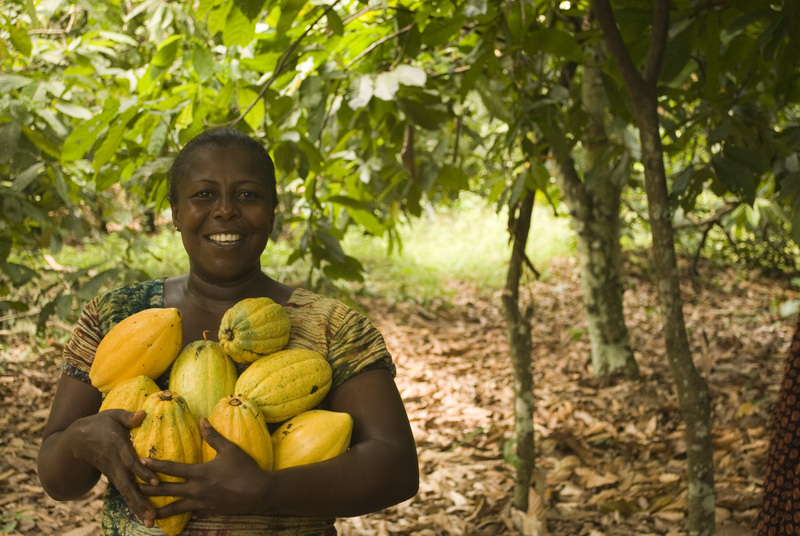 It is not easy to be a cocoa farmer, yet people do it with pride. 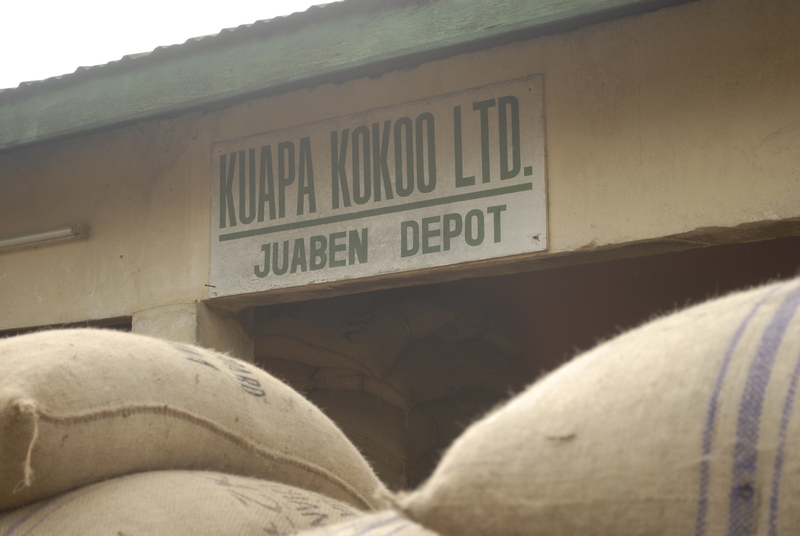 One of Kuapa Kokoo’s district depots is located in Assin Akonfudi. 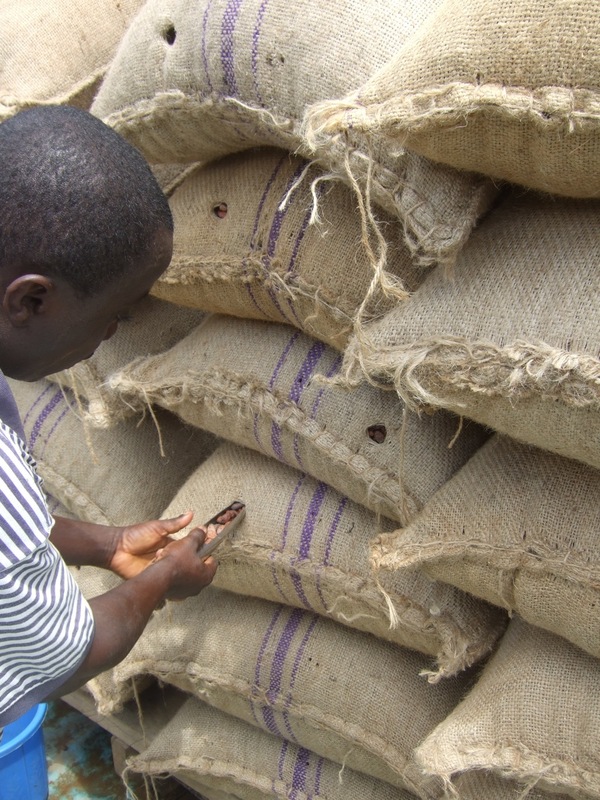 The depot is used to store a large quantity of cocoa in jute sacks, before it is being transported to the Tema harbour for export. 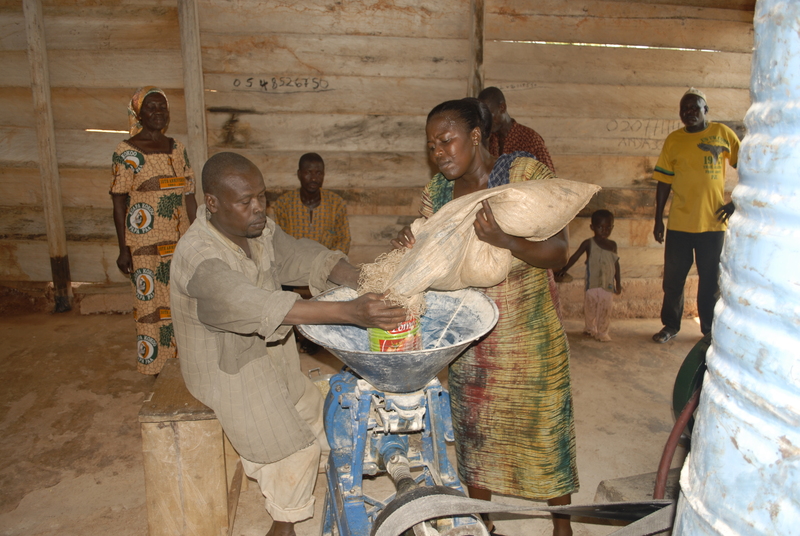 The depot collects cocoa from around fifteen villages. 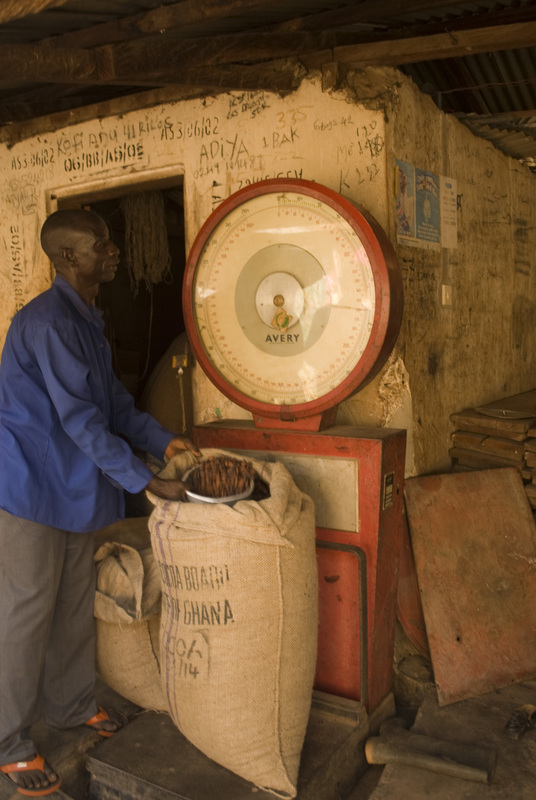 At the depot the quality is checked by people from the ‘Quality and Control Division’, a branch of a governmental board (COCOBOD) that controls cocoa production in Ghana. One day I was able to watch a quality control officer working at the depot. One of the first steps was to check the dryness in each of the four hundred bags. Each of the bags has been given a number that indicate the village of origin and can be traced. 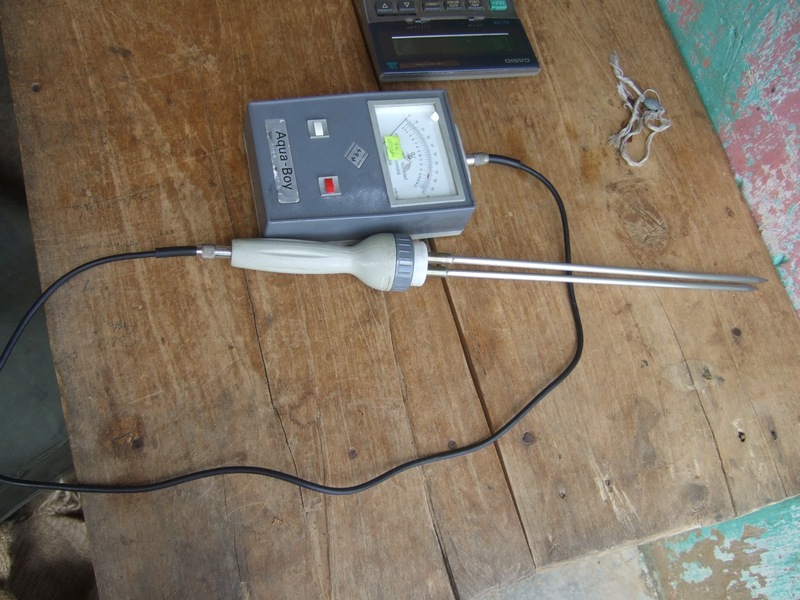 The dryness is checked with a metal instrument called aqua-boy. The next step is to take cocoa samples from four sides of each bag to make sure the cocoa in the bag is uniformly mixed in terms of colour and size. 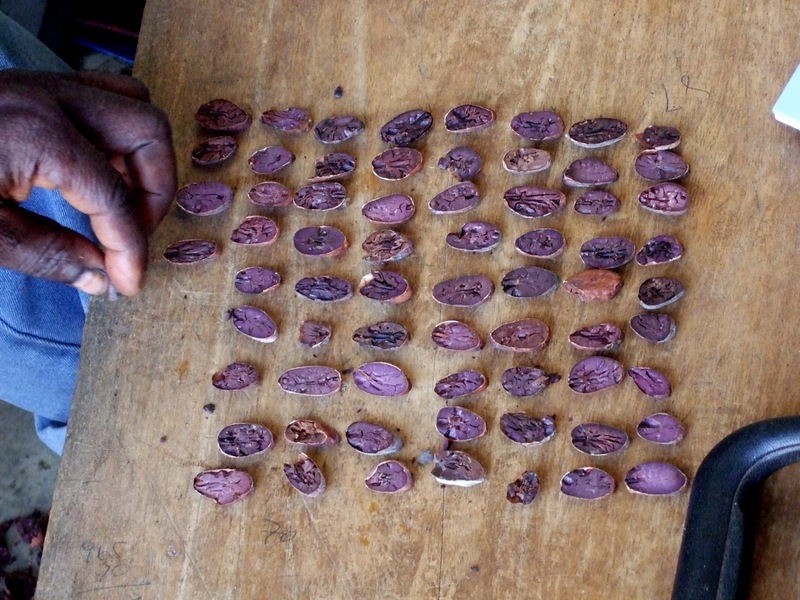 The officer then mixes all the sampled cocoa beans and takes a smaller sample that he manually cuts open and checks for mouldy beans or beans that have germinated or in some cases have not been fermented long enough which results in a special colour. Based on the results, the officer will reject or seal the cocoa and it will be take to the port on a large trailer. Another quality control officer then does the same procedure one more time at the Tema port. 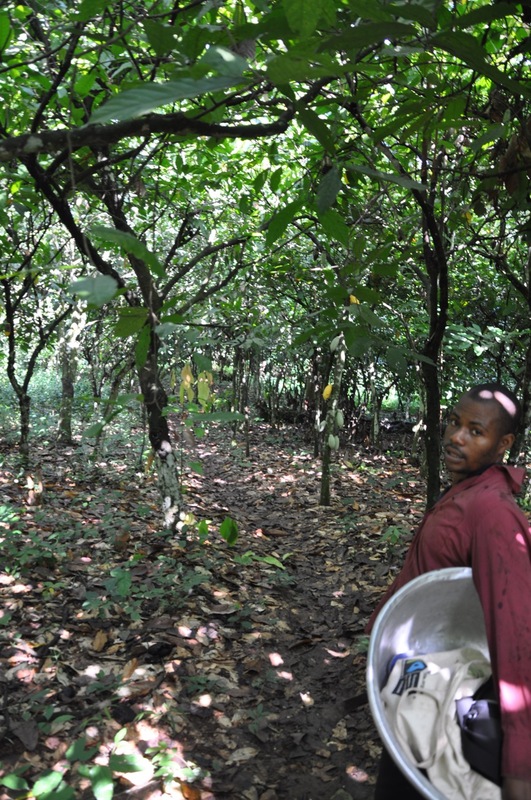 To produce good quality cocoa the farmers need to make sure that it is well fermented and well dried, two processed that demands at least two times six days. 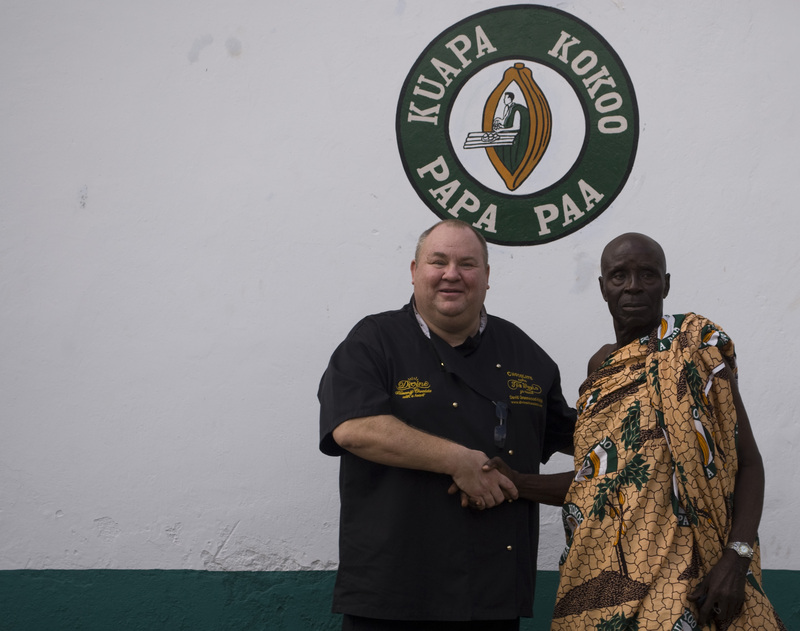 And because each bag of cocoa for Divine Chocolate can be traced back to the village of origin, the recorders are very particular about the cocoa they buy from the individual Kuapa farmer, which ensures that the cocoa in Divine is pa pa paa! – the best of the best! You are currently browsing the archives for the cooperatives category.